Our friend Captain Ike passed last night. He won his battle with cancer, he is now home with Jesus and free of pain. We saw him only three weeks ago, as he was heading out with a few sailing buddies for an afternoon on the North Fork. I looked for Vela (his sailboat) as we drove home across the Roosevelt Bridge. I knew her sails would be up as soon as she exited the harbor. But I wasn’t able to see her from that side of the bridge. I was disappointed. This how we feel right now, we would like just one more glimpse, but it’s not to be. He has sailed away to his next port. We’ve lost others to that port. So have you. We go on, knowing we will be reunited with them again, but the ache in our heart is real. For many reasons, we will miss Ike. Russ bought his first car from Ike, a 1969 Chevelle for $300. Ike and Russ’ dad were life-long friends and business partners for many years. Russ has known Ike all his life. He loved our pups, and never missed an opportunity to come and get some doggy kisses. He had a regular weekly stint with the shelter dogs at the Humane Society. His love of sailing was contagious. He had a career, he was a barber, and before that a merchant marine. We never heard barber stories though, he loved to share the stories of his sailing travels when he was younger. 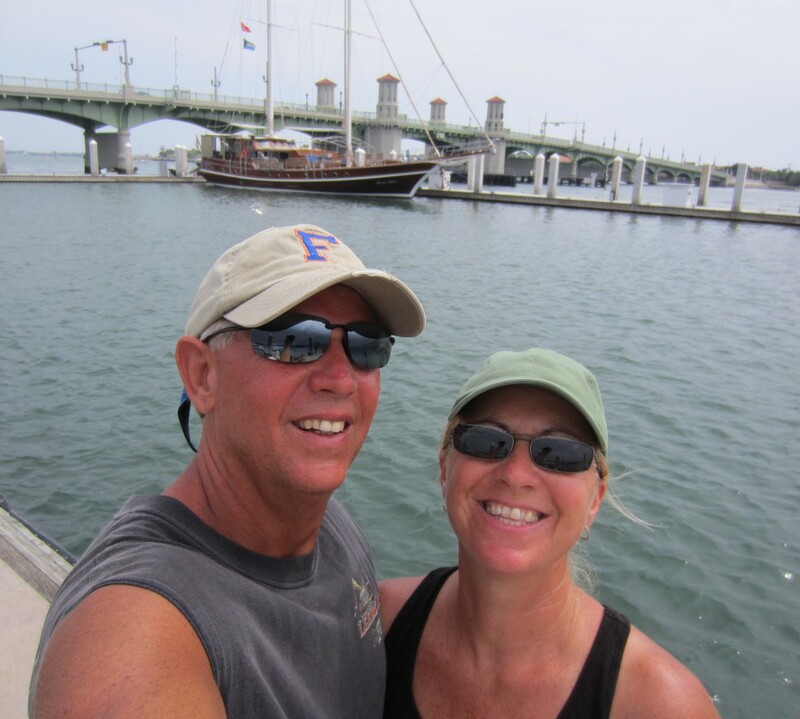 He loved to hear about where we were going and where we had been on our sailboat – and what we were planning next. He encouraged us to go. He went sailing any and every afternoon he could, even if it was only for an hour. He daydreamed sailing. He was a mentor. He tried (unsuccessfully, but not his fault) to teach me (Jennifer) a few knots. I would learn them, and then for lack of use, I’d be back to a fumbled mess of line. He shared insight, ideas and taught us much. He was always available to help us in any way he could. He made time. Whether we were working on our sailboat, loading, or unloading, he always stopped whatever he was doing to come sit on the dock and talk a spell. He regularly invited us to go out sailing with him, on a better boat. Vela was immaculate and shined. Ike was meticulous. A few years ago in 2014, he followed us to Key Biscayne. We had planned a trip to the Bahamas, but the weather that year wasn’t cooperating. We still had jobs and just a few weeks for a trip. A few days into the trip he got sick, it was Memorial Day weekend and we hunkered down in the Marine Stadium in Miami, before making our final jaunt to Elliot Key. I can see him on our port side, sailing through Biscayne Bay, because as soon as he felt just a little better, he wanted to be on the way. Happy all over his face, he enjoyed the trip, but he really wanted to go to the Bahamas one more time. He was almost 80. Two years later, while we were cruising in the Bahamas, Ike got his Bahamas trip. His friend John accompanied him for a two week trip. They met us in Green Turtle, he enjoyed cracked conch and conch salad with us one night. Enjoyed walking around the old town and reminiscing about the time he had spent there. As we moved around the islands, we saw them in Marsh Harbor and again in Man-0-War, in between their visit to Hope Town. He still had happy all over his face. He turned 82 that October. When he returned home after the Bahamas, he received the cancer diagnosis. The doctors really thought it wouldn’t be too long, but Ike was stronger than they thought. He started chemo. He had good days and bad days, and in spite of the chemo, he got out to sail locally. He fought back the cancer for almost two years. He was a strong man. He was a wise man. He was a kind man. Last summer, while he was working on a project in his backyard, he told me he didn’t know how long, but he knew he was in Jesus’ hands and that was all he needed to know. He was a good man. Our hearts are sad, but glad we knew him. Captain Ike, we love and miss you already.